I mentioned in my last recipe-related article that I’m a fan of the meal prep craze. Since I started cooking my meals ahead of time and storing them in the fridge, it has saved me a lot of time, money and energy that used to be spent pondering over what I’ll have for my next meal. Preparing my lunches and dinner ahead of time has really benefitted me in the long run, since I know beforehand what nutrients I need instead of just throwing something together on my limited time. I think many are turned off to the idea of meal prepping because they believe it takes up a lot of time cooking huge portions of meals or recipes that call for a lot of ingredients and steps that are just too much to keep up with. Pinterest has become my best friend when it comes to finding quick and simple recipes. 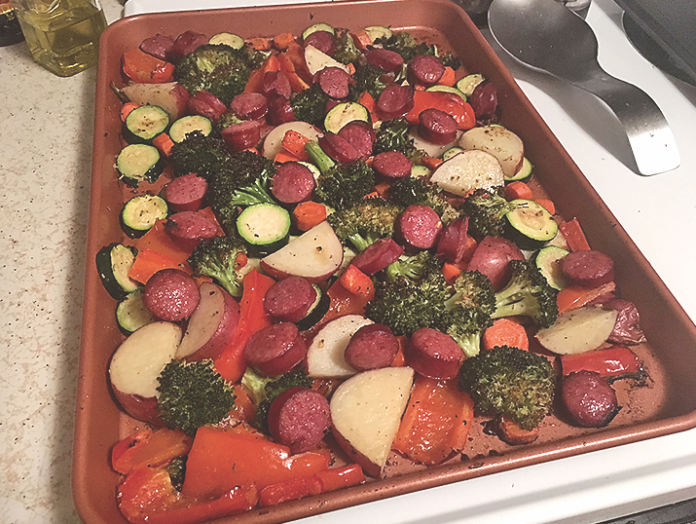 A recipe for one pan sausage and vegetables on chelseasmessyapron.com caught my eye and has already become one of my favorites. The recipe is about as simple as it gets. Throw ingredients on a baking sheet and cook for a few minutes? Sign me up! Preheat over to 400 degrees. Spray down a large baking sheet. Peel and chop carrots, cut potatoes into cubes, cut up the zucchini, cut red peppers in thin slices, cut top of broccoli into florets and cut up sausage. Put all ingredients onto the pan, pour a little olive oil and seasonings and mix around. Cook in the over for 15 minutes, take out and toss around, then cook for another 10 minutes or until veggies are crispy. Top with Parmesan cheese if you prefer and serve on a bed of white or brown rice.